(4) Figures to the right indicate full marks. 1 (a) Illustrate inside outside test. (5 marks) 1 (b) Explain 3D display methods. (5 marks) 1 (c) What is z-buffer algorithm? (5 marks) 1 (d) Write a note on Fractals. (5 marks) 2 (a) What is a display file structure? Also explain the need for display file interpreter. (10 marks) 2 (b) Wrte a pseudo-code to implement boundary fill and flood fill algorithm using 4 connected method. 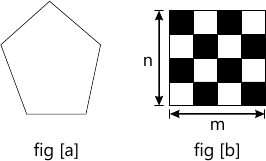 (10 marks) 3 (a) Write an algorithm to fill polygon in fig (a) with pattern given in fig(b) of size m×n. (10 marks) 3 (b) Derive Bresenham's line drawing algorithm for lines with slope < 1. (5 marks) 3 (c) Write different applications of computer graphics. (5 marks) 4 (a) What do you mean by segment? What are the various attributes in segment table? State which operations can be on segments and explain the same. (10 marks) 4 (b) Derive the steps required to perform 3D rotation about arbitrary axis. (10 marks) 5 (a) Find the clipping Co-ordinates to clip the line segment PIP2 against the window ABCD using Cohen Sutherland line clipping algorithm.